Sanada Yukimura is a famous general who lost the battle of Sekigahara and ultimately Japan. He escaped Kudoyama and planned the assassination of Tokugawa Ieyasu, though it was never carried out. Yukimura travels with Kyo in order to defeat the Mibu Clan and Oda Nobunaga. In doing so, this would free Japan from the Mibu Clan's shadow governing and give Yukimura a chance at taking over Japan. Yukimura is shadowed by a team of elite ninja called the Sanada Juuyuushi. His sword techniques are unnamed, but he uses the Sekireigan, which was taught to him by Anri. Yukimura can utilize the Sekireigan to access extreme speed, but Anri instructed him to never use it more than five times a day. When he was young, his childhood girlfriend was killed in a massacre that could have been avoided, but was not for strategic reasons. He seems to have greatly admired the Toyotomi clan's founder, Hideyoshi, when he talked about his past, and the reason to his other given name Toyotomi Nobushige. In volume 26, he fights and defeats Shindara. He also fights Kyo to a draw in volume 27, both of them using their most powerful techniques, however Kyo is not in his true body, nor has he awakened his true red eyes. Yukimura shows big progress throughout the story, but most of it occurs off the page, with Yukimura simply leaving the main party and returning a stronger warrior. He trains with Anri, one of Muramasa's guards, who teaches him the Sekireigan. With this he is able to move extremely fast and attack from many angles simultaneously. He later faces both Chinmei and the Former Crimson King himself, though he loses to the King, he is able to defeat Chinmei with the help of Sasuke and the Juuyuushi. Although he is not on Kyo nor Kyoshiro's level at the end, he is clearly as strong as the Four Emperors. 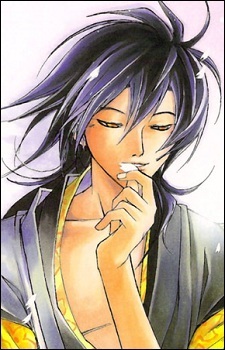 Yukimura is renowned for his casual, cheerful demeanour; he is almost always seen with a smile and often seems very preoccupied with seducing beautiful women and drinking sake. He is thirty-seven years old, and attributes his youthful appearance to good skin care. Despite this, he can be terrifying when he is enraged. He is also notable for his treatment of his ninja followers, whom he cares about and respects deeply as members of his family. As a result, the Juuyuushi are not only loyal to him, but care about him personally. Yukimura hates Ieyasu more than anything. It is interesting to note that historically, Yukimura had already fought Ieyasu's son, Hidetada (Benitora), at the battle of Ueda Castle. This is briefly mentioned in the anime and possibly the manga. It is a battle which is believed to have ended in Yukimura's loss.